Burnaware has released PDF Shaper v5.0, a feature-rich Windows utility that makes it simple to split, merge, encrypt, decrypt, and sign PDF files. In addition, the software extracts pages, text and images from one or more PDF files and converts them to standalone RTF, text and image files. PDF Shaper is free for personal and non-commercial use, and affordable for business use. Unlike other low-cost PDF programs, PDF Shaper offers file manipulation, page management, and security functions that are usually available only in high-end PDF applications. PDF Shaper makes it easy to tailor the content of PDF files. Users can split PDF files into smaller PDFs, extract individual pages, and encrypt and decrypt files. It's just as simple to merge multiple PDF files into a larger file. The software rotates, crops, and normalizes pages, individually or in batch mode. It's simple to convert a PDF file's text to the popular Microsoft Word RTF format, or to convert RTF files to PDF files. Similarly, the software converts PDF file images to standalone images, and vice versa. This allows users to turn a series of JPG pictures into one or more PDF files, or to turn an image-rich PDF file into a series of JPGs. The software operates in batch mode, allowing users to perform its functions while doing other work on their computers. PDF Shaper is optimized for low CPU resource usage, even during the CPU-intensive conversion operations. With its emphasis on security and privacy, PDF Shaper lets users update or remove PDF metadata fields such as author, title, and dates. PDF files can be encrypted with owner and user passwords. In addition, the software can set user access permissions, sign PDF files, and decrypt previously encrypted files. PDF Shaper's clean, intuitive interface allows users to become productive in just a few minutes. The program supports Unicode characters, allowing users to include characters from languages worldwide. PDF Shaper v5.0 runs under Windows 10/8.1/8/7/Vista/XP and is available in two editions. PDF Shaper Free is available without charge for individuals and non-commercial enterprises. 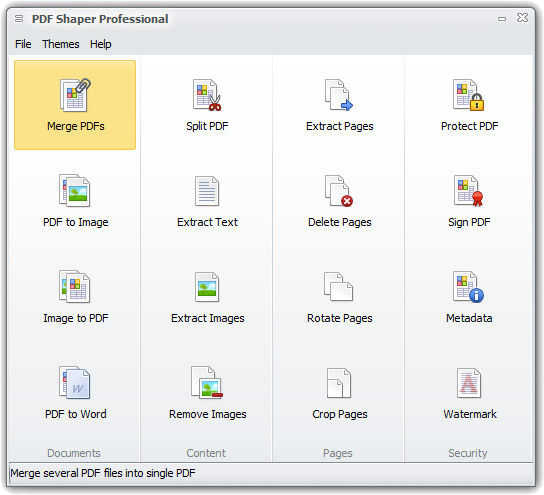 PDF Shaper Professional costs $29.95 for single-user commercial use. Lifetime licenses and commercial corporate site licenses are available.